The name Peyia refers to quite a large area, and also to the rapidly growing village of that name which sits on the hillside with magnificent views across the bay. The village has supermarkets, shops, a town hall and a choice of restaurants, bars and cafes. For amusement there is a go-kart track, a pitch and putt course and a zoo nearby. The most popular beach in the area is in the nearby resort of Coral Bay - a small but rapidly growing seaside resort just down the road from Peyia. The main attraction is the 660 yards of Blue Flag sandy beach. The warm shallow water is perfect for paddling, but this is also a big centre for water sports. A short walk from Coral Bay takes you to beautiful Corallia Beach, a quiet little bay with a small marina and a taverna or two. Corallia is regarded locally as a laid back and peaceful, with warm shallow water making it perfect for small children to paddle and play safely. 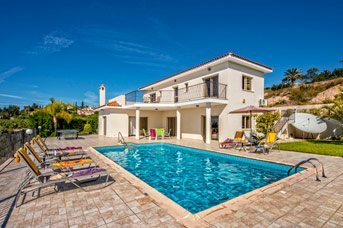 This coast is well known for its spectacular sunsets, so choose your spot carefully and watch the show!Villa Plus has properties near Peyia village, located on a hillside with views over Coral Bay. 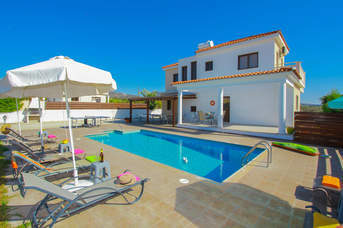 Most of the villas in this resort have large pools and a countryside setting making them ideal for a relaxing holiday. 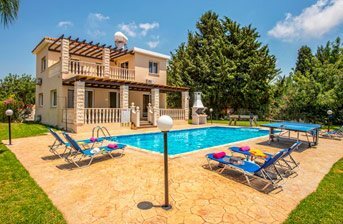 The popular resort of Coral Bay and its Blue Flag beach are also just a short drive from Peyia Village if you want to be within a short drive from the resort’s amenities. There are a few shops for your daily essentials in Peyia village, with more choice available in the nearby Coral Bay resort. Here, you will find supermarkets, leather, souvenir and jewellery shops. 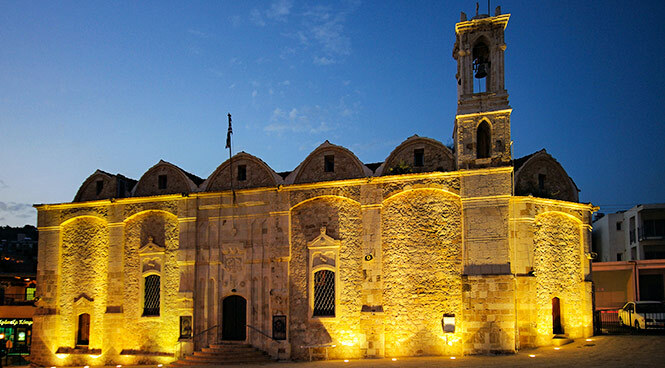 Alternatively, the historic town of Paphos is famous for its market, which sells Cypriot linen and lace, and is around 20 minutes' drive away. Peyia village is well known for its local tavernas where you can try tasty Cypriot meze, souvlaki, sheftalia and other local delights. There are also some international cafes and restaurants selling a broader range of cuisine. The popular resort of Coral Bay is a 10-minute drive from here, with an array of restaurants to suit everybody's palate. You can also visit Paphos town which has a wonderful harbour area, perfect for enjoying a meal while watching ships go by. 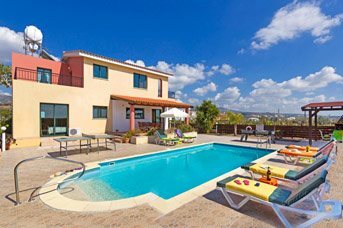 The closest beaches to the Peyia village are the Blue Flag beaches of Coral Bay and Corallia. Coral Bay Beach is great for water sports enthusiasts and has sunbed and parasol hire. It also has white sands backed by limestone cliffs, as well as shallow turquoise waters which make it ideal for swimming. If you fancy something completely different, head to Latchi, which has a beautiful pebble beach and is not far from the stunning Akamas Peninsula where you can visit the famous Blue Lagoon. In nearby Coral Bay resort, you can find the Ithaki Amusement Park, complete with a video games arcade and a cafe bar. Coral Bay Go-Karting is open seven days a week so you can test your driving skills. 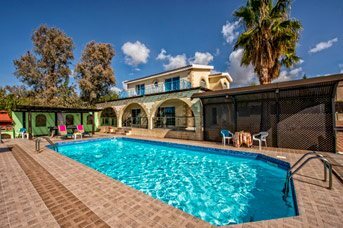 You can also visit Paphos Cosmic Bowling, which is located between the Old Town and Kato Paphos, offering many facilities including restaurants, bars, a children's play area and much more. 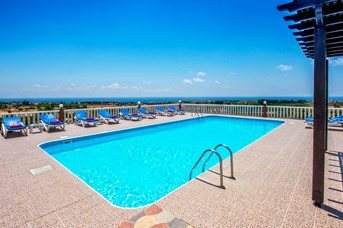 George's Ranch is in the picturesque area of Sea Caves and has a fully equipped stable. Peyia town hall is situated in the heart of this traditional hillside village. It is Infused with a sense of history and tradition and is very atmospheric. Not far from Peyia village is the UNESCO-listed city of Paphos. It has numerous archaeological sites, like Paphos Castle, mosaics and the Tombs of the Kings, to name just a few. Alternatively, not so far away are the Baths of Aphrodite, which are accessible by car.